So many of us suffer from Not Quite Right Syndrome. It kills our dreams and keeps us from moving forward in life. We don’t try new things or finish projects because we feel that they aren’t quite right. What we really mean is that they aren’t perfect. It’s normal to want to do something well or put out a good product, but if we wait around until it’s perfect we will be waiting around forever! It’s important to start. We can’t get better at anything unless we practice it. The example I think of most often is comic strip writers. They start and we think they are good, but they continue to improve over time. Let me show you. This is the first Peanuts comic strip. It doesn’t look much like the Peanuts that we are familiar with. Charlie Brown doesn’t even have his signature zigzag on his shirt! Here is a strip that Charles M Schulz did about 10 years later. His drawing style is more sophisticated. He got better because he drew a strip just about every day for 10 years. When I think I should wait to send something out into the world because it isn’t quite right, I remember these comic strips. I know I can’t get proficient at anything unless I start doing it regularly. Frankly, it’s why I started making weekly videos. My long-term goal is to create online leadership classes and I was very unhappy with my first attempts. I learned and got better, but realized that the only way to get really good was to practice making videos regularly. Hence, my commitment to make short weekly videos. 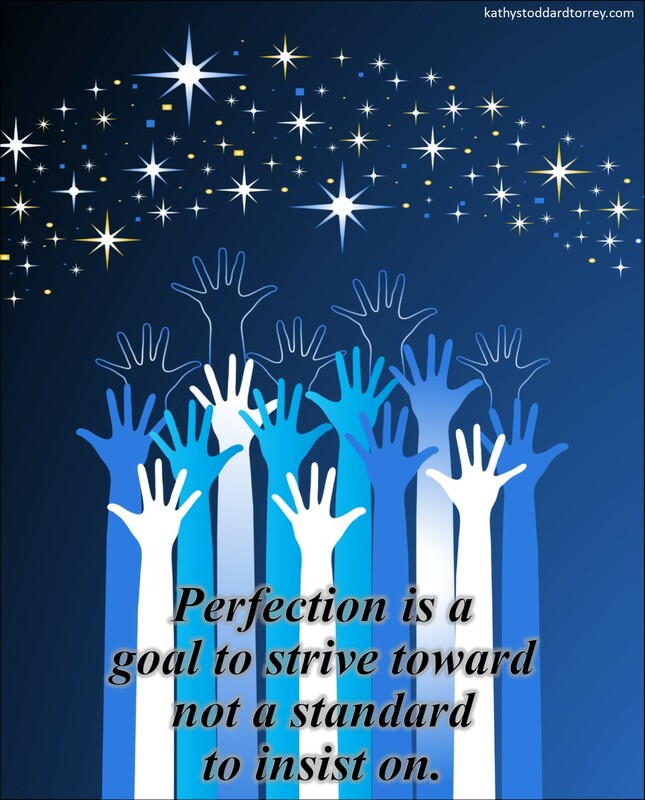 We don’t want to wait around for perfect, but we also don’t want to put out junk. So what’s good enough look like? My husband who was in the military for 30 years said that one of his first commanders taught him that 80% on time was better than 100% late. I like that guideline because it’s flexible enough to be useful for our purposes. Let’s start with what “late” means. Sometimes “late” is obvious; there is a deadline or cutoff. However, sometimes we are setting the dates for personal projects. I could have continued to put off making videos, but I set myself a hard deadline of New Year’s Day. It’s good to set deadlines if none exist. Now, what does 80% look like? We each get to decide for ourselves. The entire discussion around Not Quite Right started when I looked at the first video I published in the Renewed You series. It is absolutely not perfect. There are several things that bug the heck out of me about it. However, I decided that it was good enough. I did not want to do it again AND I wanted to hit my deadline so I went with it. It’s not nearly as embarrassing as the ones that I started with about three months ago. Those will never see the light of day! Most importantly, I learned things that will help me to get better. My inner critic did a pretty good job of pointing out all the small issues with my first video. Our inner critics can be pretty harsh. Our outer critics, also known as friends and family, can seem pretty harsh as well. It’s important to know that both our inner and outer critics just want to keep us safe from insult and emotional injury. It’s because they care about us, and that’s important to remember. It’s OK to remind both your inner and outer critics that you are tough and you can handle any criticism that comes your way out in the big wide world and that it’s also OK if you fail. It is OK if you fail. It takes courage and a thick skin to get out there in the world! However, I know that I would feel much worse in 10 years if I looked back and had never tried than if I looked back and saw that I failed. Regret is a terrible thing. If no one watches my videos or reads my blogs but my great, great grandchildren 100 years from now, I’m OK with that. They will know that their granny was not afraid to give it a shot and maybe that knowledge will give them courage to do the same.